What is Horns for the Holidays? Horns for the Holidays is a grass roots organization founded in 1996 by Ken Kozora that connects used instruments with children who might not otherwise be able to afford an instrument of their own. How do we do this? YOUR HELP! Please donate your used musical instrument, encourage others to donate, and spread the word! Horns for the Holidays has been collecting under-used musical instruments from the community and giving back to the kids who need and want them for over 10 years. Where? You ask? Well, the Chelsea Alehouse for one! and When? Well… how about this weekend?? 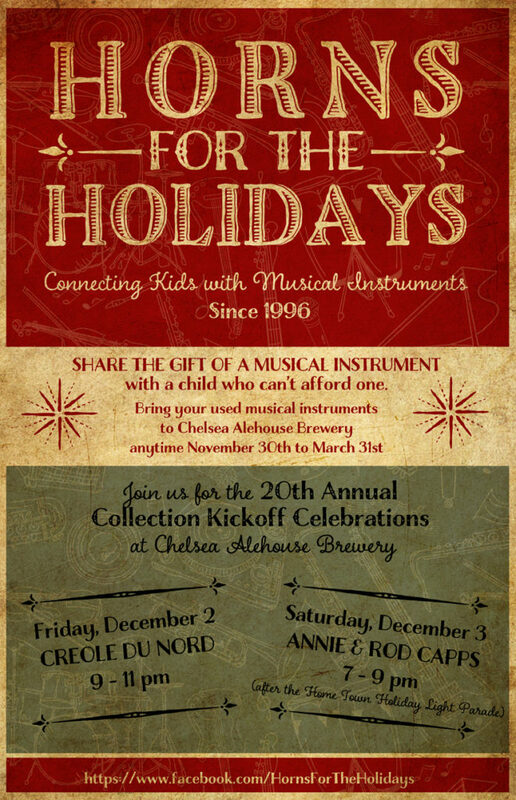 The Alehouse will be celebrating a full weekend of music to kick off the Horns for the Holidays used musical instrument drive, with Creole Du Nord on Friday, Dec 2nd and we’ll be there on Saturday, Dec 3rd! So dig out that trumpet collecting dust in the basement or old ukulele or penny whistle or…. ALL instruments are accepted! On a personal note, this has been a year filled with unexpected losses both public and personal but even though part of me will be glad to bid 2016 good-bye, another part of me will remember all the beautiful people and places we’ve been fortunate to experience, all the music we’ve had the privilege of sharing, all the hugs and smiles that landed at just the right time and the hopefulness that even in these challenging times, we can’t shake for the life of us. If we don’t have the chance to tell you in person, we wish you a wonderful holiday season and hope that you’ll be surrounded by love, laughter (and comfort when you need it).